Hoop dreams! 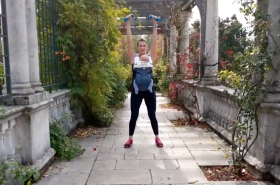 Get your hoops skills up with this whole body, core and posture workout, designed to create real support in all the places new mums need it. 10 reps of each move, done back to back to form a circuit of 40 reps… then 1 min rest and repeat for 5 circuits. Move 1. Alternating lunge with hoop twist. Move 2. Rear lunge with overhead hold. Move 3. Side squats with hoop hold. Try and keep going all the way to 40 reps with great form and core supported posture. 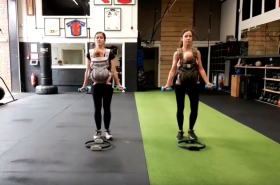 This is about maintaining core activation throughout a series of multiplane movements – a bit like motherhood… this workout does not happen in a straight line!